Indonesia Welcome To Our Site.. Promised Land Ministries Global Outreach mission will be returning to Indonesia this March to teach and conduct 4 - Schools of Deliverance 101 over a three week period. Indonesia is the largest Muslim population in the world, where the Lord is doing wonderful things, likened to a "Mighty Wind” Revival. This very important and challenging mission is to establish strongholds of Christian Deliverance in strategic locations throughout Indonesia, including Tarutung and Medan in Northern Sumatra, Bengkayang in Borneo and Denpasar in Bali. 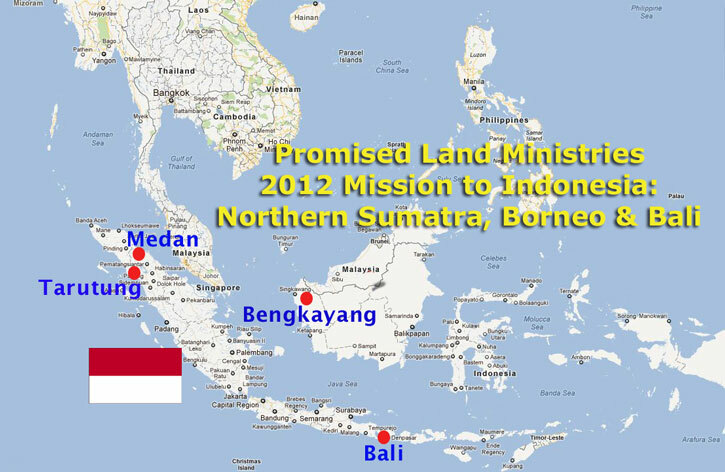 Promised Land Ministrie's Pastor Jozef Jasinski and Michael Miller of Canada will be joined by Pastor Carl Henderson, along with a Pastor Eddie from the Philippines who will be meeting in Jakarta before visiting the mission fields in the northern regions of Indonesia. We ask for your Prayer support, as well as Your Financial Blessings as we undertake this mission of our Global Outreach Ministry, as being called by our Lord Jesus Christ of Nazareth. According to 1 Samuel 30:24 , those who help with prayers and the financing of missions share the blessings as if you had actually joined us on the battle front. "For who will heed you in this matter, But as his part is who goes down to the battle so shall his part be who stays by the supplies; they shall share"
This End Time battle of Deliverance and Spiritual Warfare is a body ministry and your prayers and financial support are needed Now. Indonesia, officially the Republic of Indonesia (Indonesian: Republik Indonesia), is a country in Southeast Asia and Oceania. Indonesia is an archipelago comprising approximately 17,508 islands. It has 33 provinces with over 238 million people, and is the world's fourth most populous country. Indonesia is a republic, with an elected legislature and president. The nation's capital city is Jakarta. The country shares land borders with Papua New Guinea, East Timor, and Malaysia. Other neighboring countries include Singapore, Philippines, Australia, and the Indian territory of the Andaman and Nicobar Islands. Indonesia is a founding member of ASEAN and a member of the G-20 major economies. The Indonesian economy is the world's seventeenth largest economy by nominal GDP and fifteenth largest by purchasing power parity. The Indonesian archipelago has become an important trade region since at least the 7th century, when Srivijaya and then later Majapahit traded with China and India. Local rulers gradually absorbed foreign cultural, religious and political models from the early centuries CE, and Hindu and Buddhist kingdoms flourished. Indonesian history has been influenced by foreign powers drawn to its natural resources. Muslim traders brought Islam, and European powers brought Christianity and fought one another to monopolize trade in the Spice Islands of Maluku during the Age of Discovery. Following three and a half centuries of Dutch colonialism, Indonesia secured its independence after World War II. Indonesia's history has since been turbulent, with challenges posed by natural disasters, corruption, separatism, a democratization process, and periods of rapid economic change. Across its many islands, Indonesia consists of distinct ethnic, linguistic, and religious groups. The Javanese are the largest—and the politically dominant—ethnic group. Indonesia has developed a shared identity defined by a national language, ethnic diversity, religious pluralism within a majority Muslim population, and a history of colonialism and rebellion against it. Indonesia's national motto, "Bhinneka Tunggal Ika" ("Unity in Diversity" literally, "many, yet one"), articulates the diversity that shapes the country. Despite its large population and densely populated regions, Indonesia has vast areas of wilderness that support the world's second highest level of biodiversity. The country is richly endowed with natural resources, yet poverty remains widespread. Borneo (Malay: Borneo, Indonesian: Kalimantan) is the third largest island in the world and is located north of Java Island, Indonesia, at the geographic centre of Maritime Southeast Asia. The island is divided among three countries: Brunei, Indonesia and Malaysia. Approximately 73% of the island is Indonesian territory. The Malaysian states of Sabah and Sarawak in the north occupy about 26% of the island. The sovereign state of Brunei, located on the north coast, comprises about 1% of Borneo's land area. Borneo is home to one of the oldest rainforests in the world, along with the Daintree Rainforest in Australia and the Amazon rainforest.